AMOEBA is a research project to build a true distributed operating system using the object model. Under the COST11-ter MANDIS project this work was extended to cover wide-area networks. 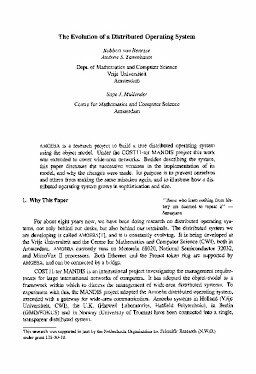 Besides describing the system, this paper discusses the successive versions in the implementation of its model, and why the changes were made. Its purpose is to prevent ourselves and others from making the same mistakes again, and to illustrate how a distributed operating system grows in sophistication and size.